The next best thing to Chowking's chao fan. Our PAL flight to Cebu from Busuanga was cancelled and we were housed at Zuric Pension Coron. 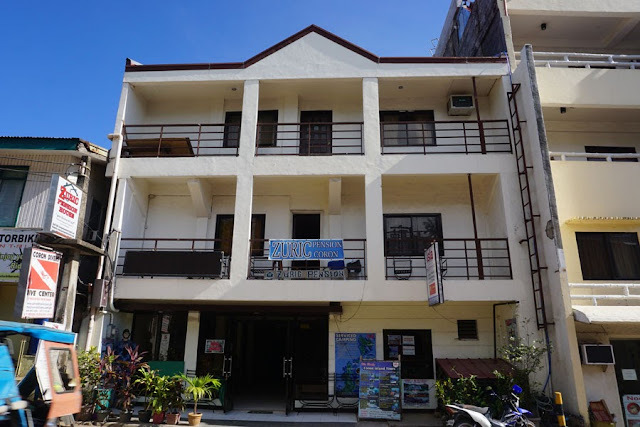 The pension house is in the center of town, just across Centro Coron, and is therefore also walking distance from Mt. Tapyas, the market, and the port. On the outside Zuric Pension Coron looks like a simple three-storey building. We walk in to a simple, barely furnished lobby. Up the stairs and we discover that the building was added/attached to a house (which is now part of the pension house). Our room is in the "house" part of the pension house. 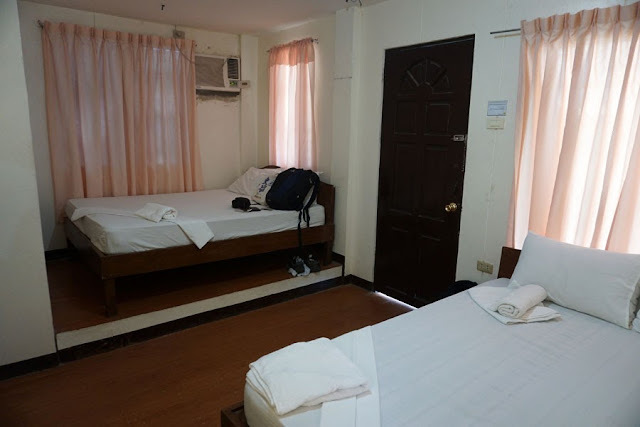 The room for four (Php 3000) with ensuite toilet and shower was spacious and clean. The room had an air conditioning unit, a wall fan, and a TV. Towels and toilet paper were provided. Breakfast though is not included. Meals can be ordered through the reception and it will be served at the common dining area. Zuric Pension Coron has WiFi but it was either very weak or nonexistent at our room which was at the back end of the third floor. The best thing about this pension house is the very kind and friendly owner, Mary Ann. While we were waiting for the van to pick us up and take us to the airport, she spent some time talking with us and sharing about her life. By the time the van arrived, she had finished her life story and it felt like we were old friends. In 2009, my friend and I did a DIY tour of Culion Island: we took the public boat from Coron to Culion and just roamed around the town by ourselves, without any guide. 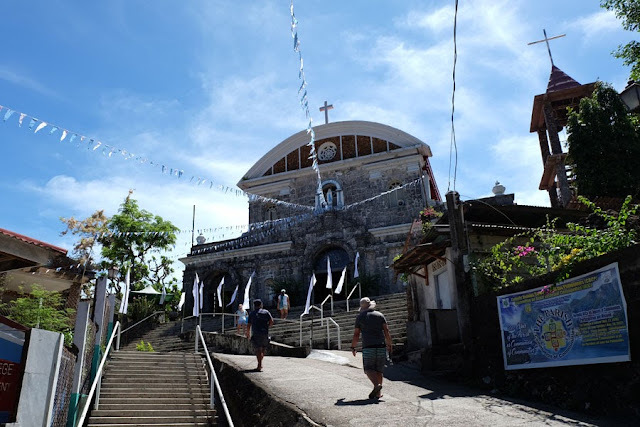 We only knew that Culion Island was once a leper colony and that the church we visited was really old. 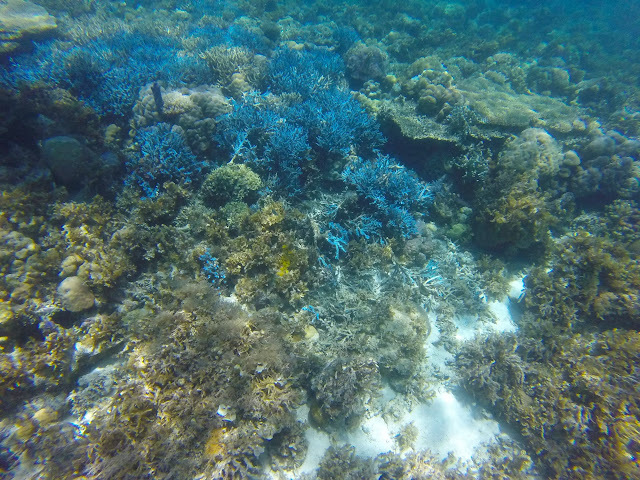 After leaving Culion Island, we dropped by Crowning Glory Reef, just a few minutes' boat ride from Culion Island, for snorkeling. 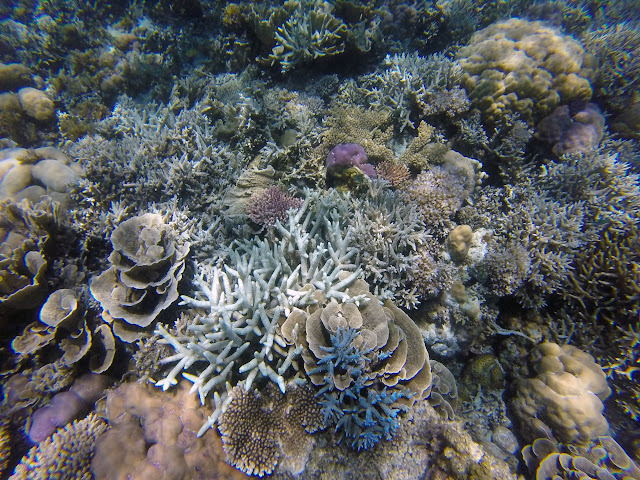 Crowning Glory Reef is a Marine Protected Area and, wow, were the corals magnificent! I am the laziest person alive and do not like to exercise but the fierce current gave me a great workout (without my breaking a sweat haha!) and I had an awesome time doing so (I thought I'd never say this in relation to exercising!). Tip: If you know how to use and are comfortable using fins/flippers, bring and use them in case nature gives you the same challenge it gave us. 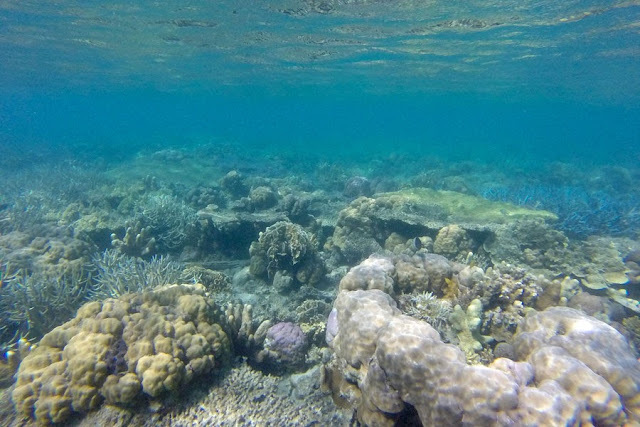 Much as we wanted to stay and snorkel some more at Crowning Glory Reef, our strength ran low and we accepted defeat and went to our next and last stop: Lusong Gunboat Wreck. 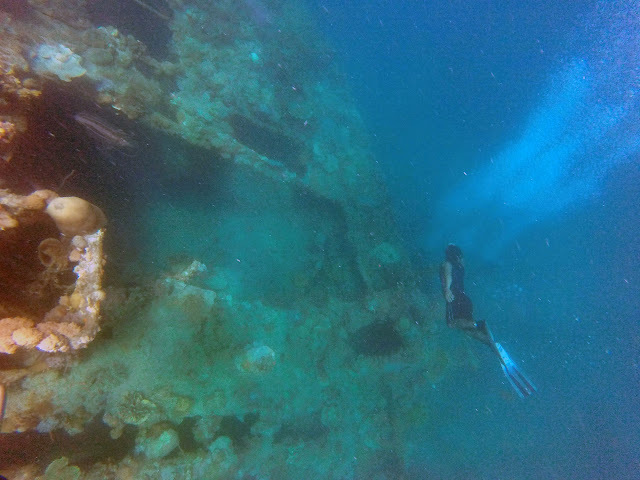 The wreck is in shallow waters and is clearly visible and perfect for snorkeling (no diving required!). 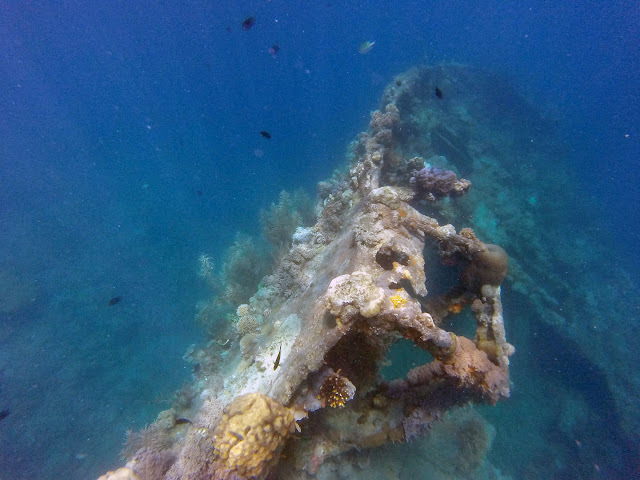 Corals have grown on the wreck all the more making it a pretty site for snorkeling. Private Tour or Join In Tour? Join-in Culion Historical Tours through tour operators based in Coron will go from Php1200 to Php1800 per person inclusive of boat, guide, lifevest, and lunch. 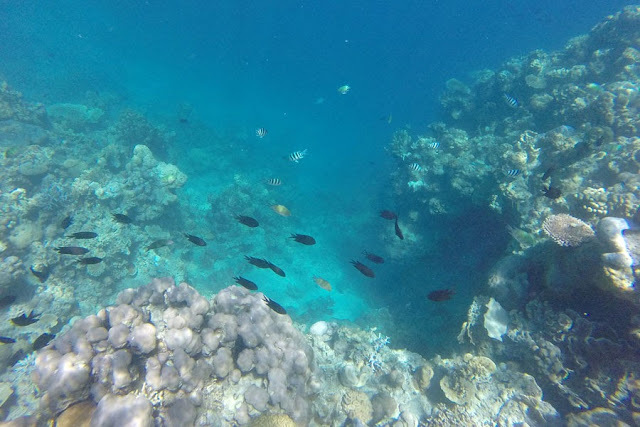 These join-in tours will visit Culion Island (Culion Church, Culion Museum, and other historical landmarks) and will drop by a marine park for some snorkeling. For our Culion tour, although quite expensive at Php11,600 for 5 pax (inclusive of boat, guides, lifevest, lunch, snorkel and mask, and other expenses at Culion Island such as tricycle rides, water, snacks), we opted to go on a private tour with the only tour operator based in Culion. 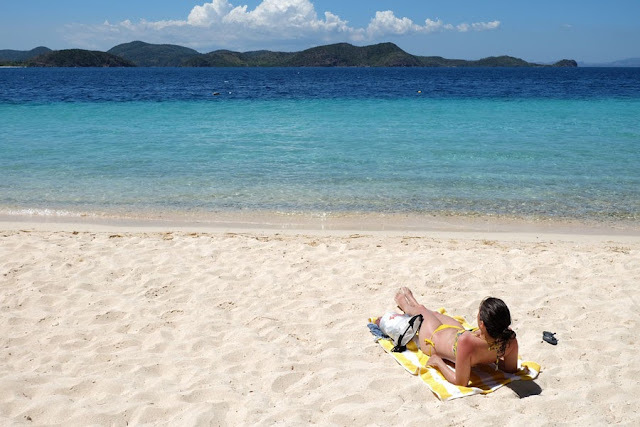 Where did we book our private Culion Tour? Would I recommend this tour operator? Yes. A big resounding yes. 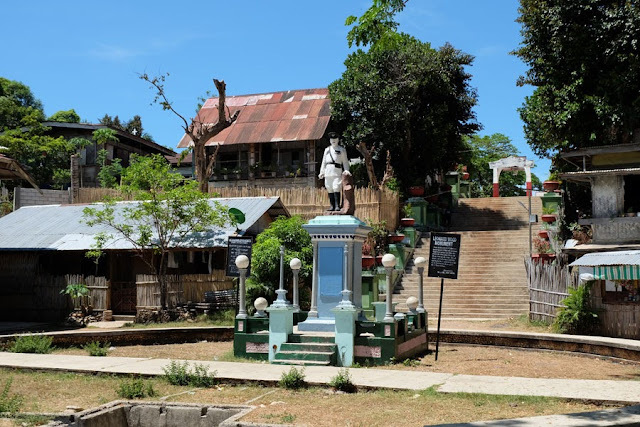 Especially if you are interested in the history of Culion, once a leper colony. Kawil Tours is based in Culion with owners/guides who grew up in Culion, and could therefore share accurate stories of the island. On top of that, the owners/guides are very accommodating and will really look after their guests. And although they are based in Culion, a 1.5-hour boatride from Coron, they came to pick us up at Coron Town on time. Though it's my third time in Coron, I have never done the Coron Island Escapade Tour. The first time I was in Coron, in 2009, the day we decided to do to Coron Island Escapade Tour, the weather wasn't cooperating and no boats were allowed to sail. 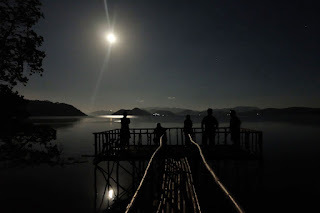 My second visit, in 2012, was too short and we could only do the Coron Ultimate Tour. For this trip, I demanded we reserve one day for this! Yes, demanded! I could not miss it the third time!!! The long boat ride (1.5 hours) to these islands was worth it. The first stop was Malcapuya Island. We docked our boat on the back side of the island and made the short walk to the opposite side where the long stretch of white sand of Malcapuya and different shades of blue of the sea and sky made me want to stop time. What's there to do in Malcapuya Island? 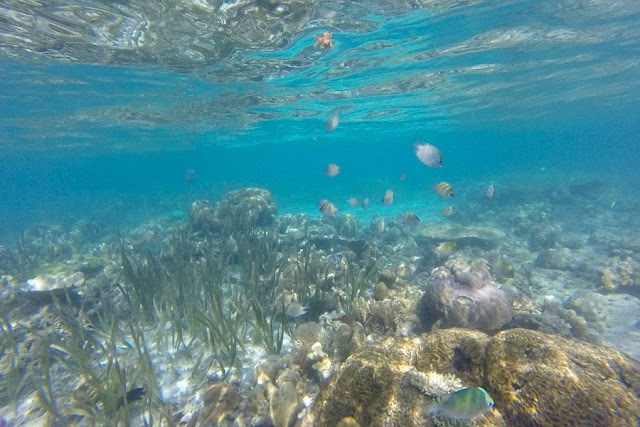 The guide said there is a snorkeling area but I did not dare go as it looked too far and the waves a bit strong. My friends and I just settled under the shade of coconut trees (some took a nap in a hut), and after a bit heeded the call of the sea for a swim, while waiting for the guides to prepare lunch. Another 10-minute boatride and we were in Bulog Dos, the third and last stop for the Coron Island Escapade Tour. My friends and I settled in the shallow water by the sandbar and just soaked without a care in the world for the duration of the stay. 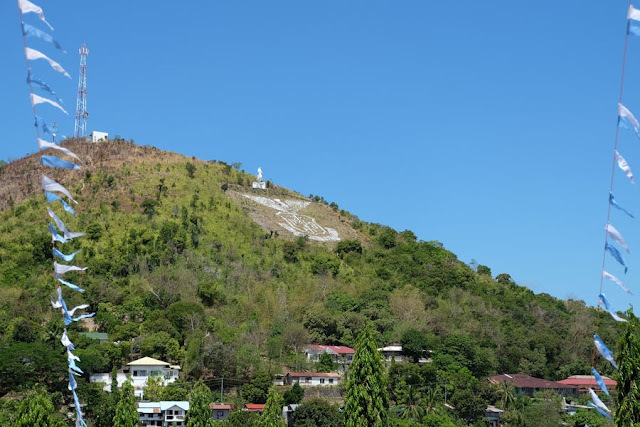 Where did we book our join-in Coron Island Escapade Tour? Would I recommend this tour operator? Yes. The guides are enthusiastic and the tour leaves on time. Any downside with a join-in tour? The itinerary is fixed and you cannot dictate how long you want to stay on each island. You'll just have to make the most of the time allotted by the guide for each island. But, private or join-in tour, the time to head back to the town of Coron is strictly followed as the Coast Guard is very strict. Coron Ultimate Tour. 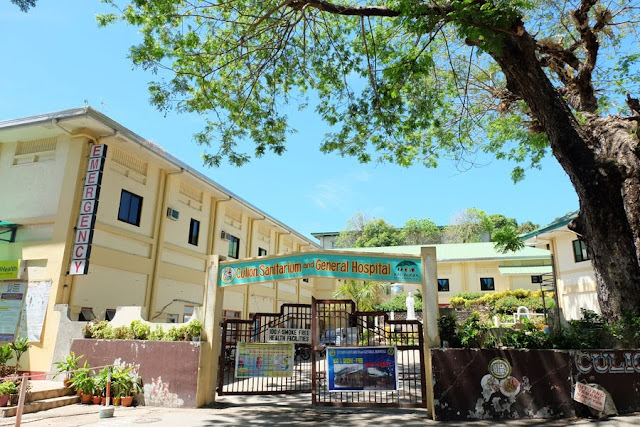 The first time was in 2009, followed by 2012, and the third time when direct flights to Busuanga from Cebu have been brought back – 2017 (now). Why do this tour over and over and over again? Because it's beautiful. 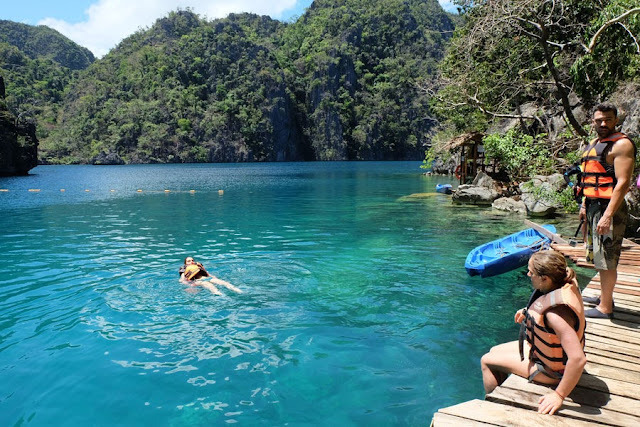 The Coron Ultimate Tour visits Kayangan Lake, Twin Lagoon, Siete Pecados Marine Park, and one or two other spots (usually a beach for lunchtime) depending on the tour operator you have booked your tour with. The path to Kayangan Lake is now made of concrete steps (it used to be just steps fashioned from rocks and soil). The viewdeck is still there but with a long tail of people queueing to have their photo taken. In Kayangan Lake itself, the boardwalk is longer, the lake still clear, but dotted with so many people forced to wear lifejackets (mandatory after two Czech tourists drowned while free diving in Kayangan Lake in March 2017) within the area allowed for swimming (no swimming beyond the roped area!). Other than that, the water is still crystal clear and the spots still breathtaking (literally from all that swimming, and figuratively from its awesome beauty). Private Tour or Join In Tour? Since we were just five in the group, a private tour (Php 2100 per person) would be more expensive than a join-in tour (Php 1500 per person). But still we opted for a private tour because we planned to leave early and go to Kayangan Lake first to avoid the crowds. 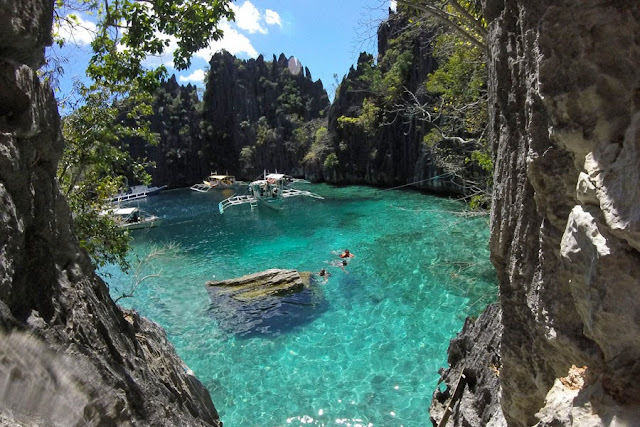 Where did we book our private Coron Ultimate Tour? Calamianes Expeditions and Ecotours. Would I recommend this tour operator? No. N–O, NO! We booked the tour a day prior and made a 50% downpayment. They told us pick up time would be from 8AM to 830AM. We were already waiting by 8AM (we wanted to start early). After sending some text messages and making some calls, the van arrived at 830AM. Fine, it was still within the time frame they had set. The van took us to the port (a 5-minute walk from where we were staying!) where, when the van driver finally found the right boatman, the boatman asked us for the itinerary. We didn't have it. It's the tour operator's responsibility to inform and hand over the itinerary to the boatman, not us. We boarded the boat and were made to wait because the tour operator still had not delivered the food for lunch and the snorkeling gear. 10 minutes of waiting...20...30...more text messages sent and calls made. When one of our friends have had enough, she took over the call and talked to the owner of Calamianes Expeditions and Ecotours. My friend's anger fired up when the owner herself did not sound concerned and gave a lame reason that they had so many guests to attend to. 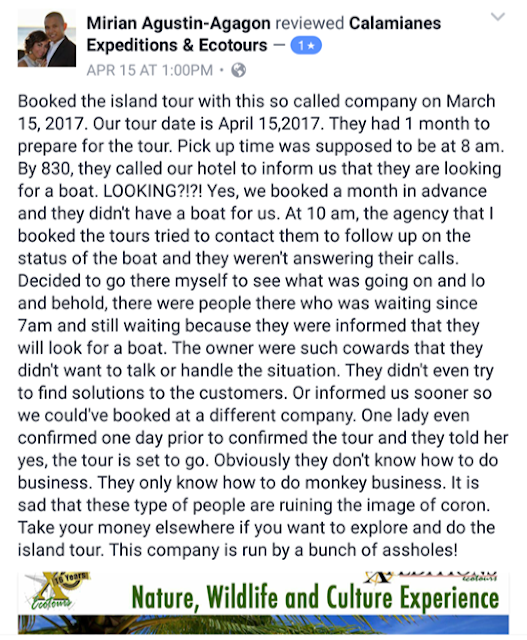 (If they could not handle many guests they could have just declined the day we made the booking and we could have just booked through another tour operator–there are so many in Coron.) Many tour boats have already left and we were still at the port simmering. We left the port at around 930AM, after an hour of waiting. Again, N–O, NO! Here's another tour group (two days after us) that had a terrible experience with Calamianes Expeditions and Ecotours (when I checked their facebook page again, they had already disabled and deleted all reviews). 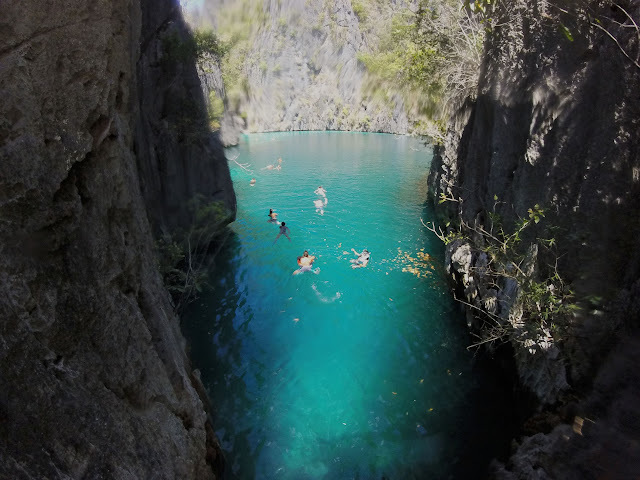 Do go on the Coron Ultimate Tour, just NOT with Calamianes Expeditions and Ecotours. N–O, NO! A 45-minute tricycle ride (Php 800 for 5 pax, roundtrip, arranged through Kingfisher Park) from Coron Town and we found ourselves at the gate of Kingfisher Park, where Ale (short for Alejandro), the park ranger, welcomed us. The small hut at the gate was lit by a single lightbulb and all the rest of the park was lit by moonlight. Even in the dark, we immediately knew we'd like this place. Or maybe it's our age and wanting to get away from crowds (we were the only guests at Kingfisher Park that night). 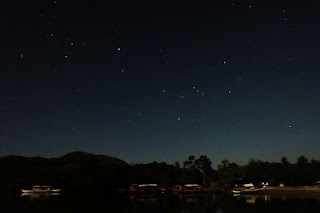 Before starting the Starry Starry Night Tour (Php 300 per pax), the name of their one-hour firefly watching kayak tour, Ale took us to the boardwalk where we happily conversed in Visayan, telling us about himself and about the park, looking at constellations and trying out his newly installed constellation app. 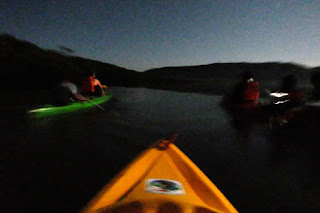 It was a good 15 minutes of free flowing conversation in our native tongues and staring at the moonlit surroundings before we had to go back to the shore to don lifevests, meet our guides, and start the tour. The guides shared bits and pieces about fireflies, taking us to trees where there were twinkling little fireflies. When my guide found out we were all Bisaya and when we all found out our guides (except for one) were Bisaya, that's when the serenity of the park was shattered. It was a big relief to speak in our own dialect! That's how the guides must have felt too for from then on they were on a roll with their jokes. Don't know how to take photos of fireflies but, honest, there are fireflies in those trees! Yes, we saw fireflies. And planktons too! 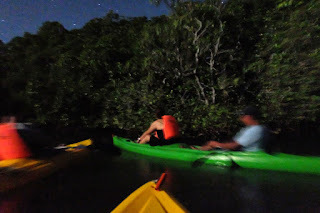 It was an enjoyable night and we wish to go back to Kingfisher Park to try their daylight activities (hiking on Lunes Santo, kayaking through the mangroves, bird watching, and trekking to Kaluluwang Falls), camp, and enjoy the nature, peace and quiet, and blanket of stars that surround it. To book (advance booking is required) any of the activities in Kingfisher Park, contact them at the numbers posted above. Transportation to and from the park can also be arranged through them. 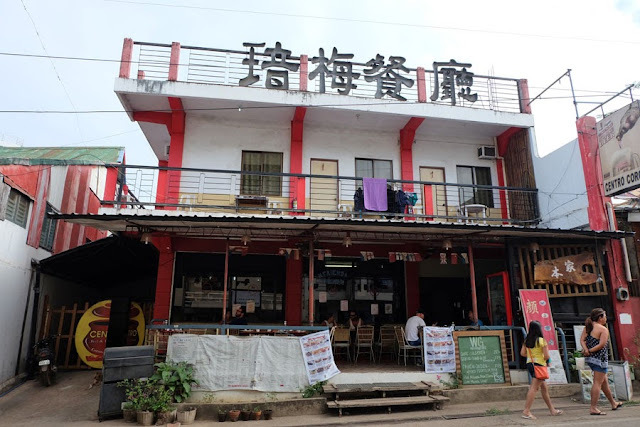 Six years, red paint, some Chinese characters, and Centro Coron doesn't look anything like the photo I saw in their facebook page. 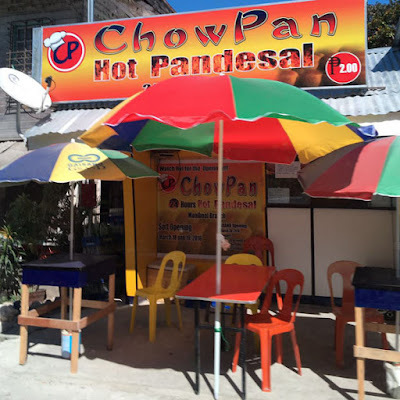 Nevertheless, I was glad to find that it was indeed in the center of the town of Coron, just walking distance to Mt Tapyas, the market, and the port. We booked their room for 5 persons for Php 3000 a night, with free breakfast and airport transfers. (Full payment through BPI deposit is required to confirm the booking.) They let us check in when we arrived a little after 10AM and the room was already prepared and cool (AC was already on). 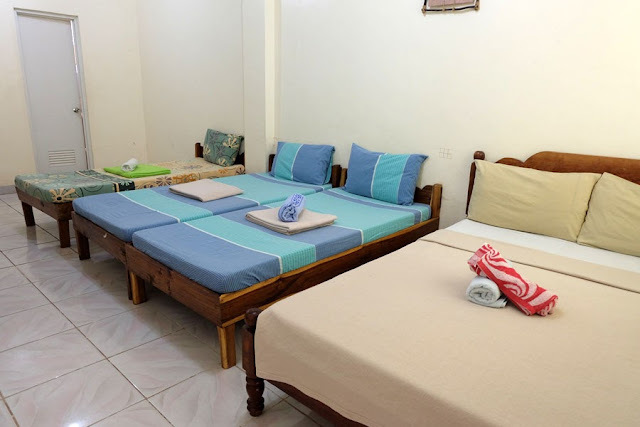 Centro Coron's rooms are simple and clean. Towels, toilet paper, and hangers were readily available. The room for 5 persons did not feel cramped. The room also had an electric fan (though we never used it because the airconditioning unit did its job well) and flat screen TV. Centro Coron also has WiFi. 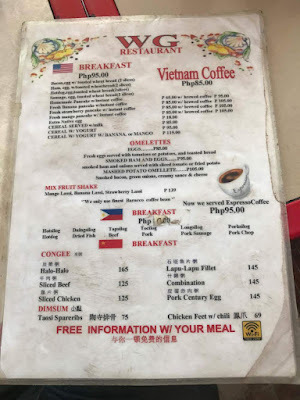 Breakfast is served from 6AM to 10AM, but we found that it is best to place your orders early as it takes their undermanned restaurant (I only saw 2 waitstaff and 1 cook) quite a long time to prepare the food. For the free breakfast you can choose from any of the below-Php100-priced breakfast items (only the pancakes come with free coffee). 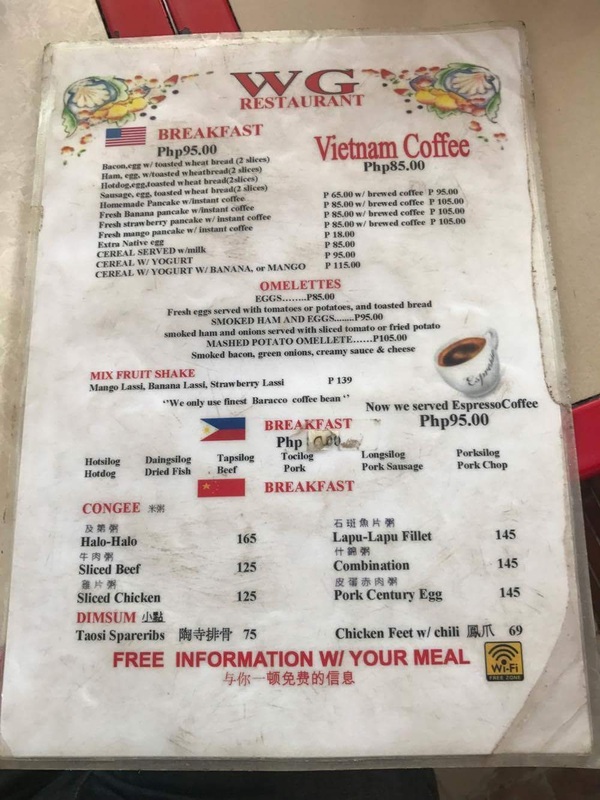 I recommend their daingsilog. Breakfast menu. Click to enlarge. I'd like to commend Angelica, Centro Coron's receptionist, for being very helpful when we needed to go to the airport earlier than scheduled. When most vans had already left and we couldn't wait for our schedule, she found us a ride. Thank you very much Angelica! But if there's nothing to forgive, don't forget. Forgive. If your itinerary goes all awry, forgive yourself or whoever or whatever caused it. Go to Plan B. If there's no Plan B, smile, wing it, and just make the most of the situation. bring your underwear. My little piggy friend forgot to bring his undies when he traveled to Myanmar for a week! Haha! Or maybe he did that on purpose. Must have been very airy down there in the scorching, dusty lands of Bagan! keep your passport with you at all times, else you undergo horrifying minutes that could feel like hours like Brennan of The Weekend Dispatch experienced when he traveled in India. bring your memory card and/or extras (if you're using a camera). When we were in Sabtang Island (Batanes), a fellow tourist approached us begging to borrow an extra memory card because he had forgotten to bring his! turn off your MP3 player (or whatever gadget) after using. Or if you do forget and it drains the battery, I hope you did not forget to bring your charger. have an open mind. The possibilities are endless. Enjoy your trip!